A departure from ordinary potato salad, this Creamy Dill and Cucumber Potato Salad could not be more perfect for summer! 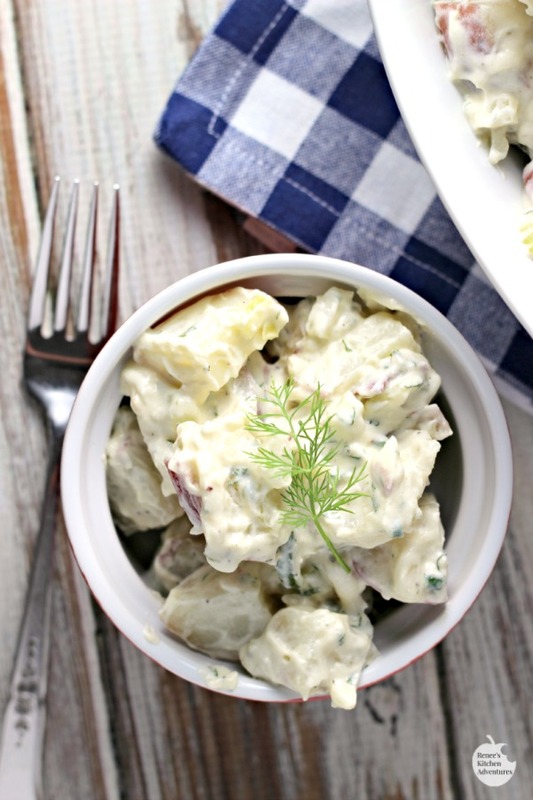 Red potatoes, crisp cucumbers, sweet onions, sour cream and fresh dill all come together in this tasty cucumber potato salad side dish. So good, you'll be wanting seconds! You are probably asking, "cucumber potato salad?" And I'm here to tell you YES! Why not? Pickles are a standard ingredient in most potato and macaroni salads and well, a cucumber is a pickle at heart...so yes, why not? Cucumbers are also perfect partners with the flavors of this salad, sour cream and dill, so they are a natural choice here! They provide a nice little low calorie, low carb crunch to this salad which is a nice contrast to all the creaminess! I think there are two types of people in this world...those in the potato salad camp and those in the macaroni salad camp. I can go both ways, but if I had to choose only one, I'd go for potato salad every single time. Something about the different textures of potato salad that interests me. My hubby? 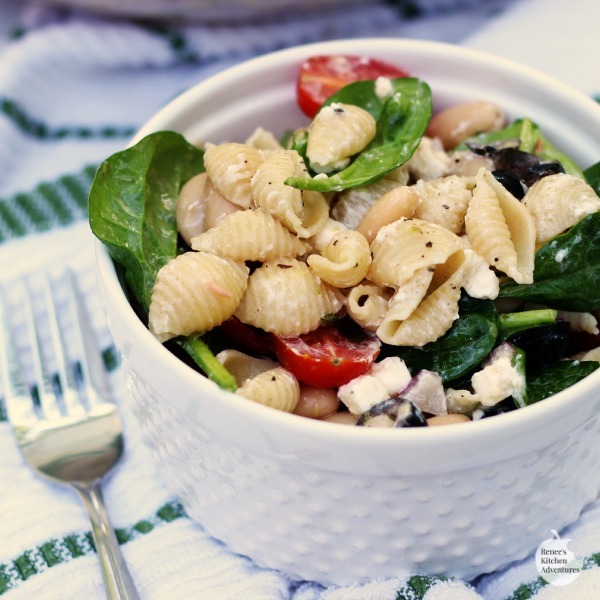 He is most definitely in the macaroni salad camp, and for that reason, when I do make summer salads, they tend to be pasta ones to please him. Every now and again though, I squeak in a potato based salad like this cucumber potato salad He actually enjoyed this potato salad, so I think that says a lot about this particular recipe! I lightened this salad up by using reduced fat mayo and reduced fat sour cream and they worked out perfectly! I decided to use red potatoes here, because I like that they are a little less starchy than the white varieties and hold their shape nicely once they are cooked, but still have a bit of creaminess to them on the inside. Fresh dill is a must! This time of year, I have plenty of fresh herbs growing outside my kitchen door, but you can easily find fresh dill at most grocery stores if you don't have an herb garden available to you. If you are looking for a potato salad that is just a little different from the ordinary, give this cucumber potato salad version a try! 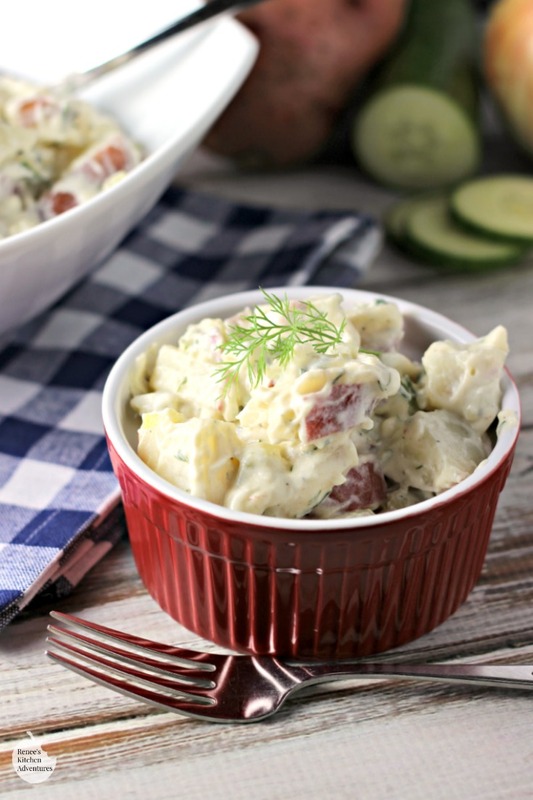 If you are a lover of dill and cucumbers, this cucumber potato salad is a must make for you! I love to put a little spin on a classic recipe like potato salad and love it even better when it becomes a keeper like this one! 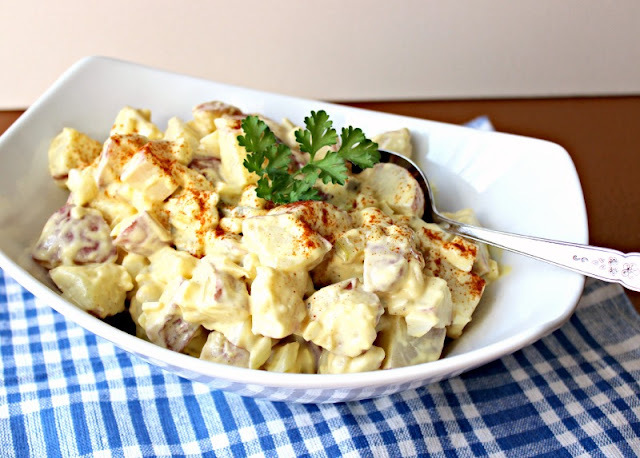 A twist on the classic potato salad! 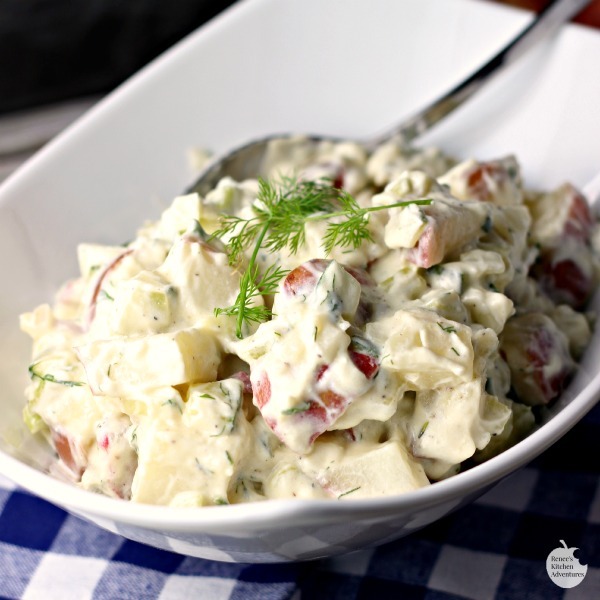 Red potatoes, cucumbers, sour cream and dill come together in a summer salad everyone will love. Gently boil potatoes, starting with cold water, on stove until fork tender, but not falling apart. Drain. Return them to empty pot and allow to sit in warm pot while preparing the rest of the ingredients to dry out. In large bowl, combine the mayo, sour cream, vinegar, Dijon mustard, and granulated sugar. Taste for salt and pepper and add as you like. Whisk everything together. Add in the reserved potatoes, celery, onion, cucumber, dill and chives. Gently cover all ingredients in the mayo mixture. Taste again and adjust salt and pepper as you like. Check out these other great summer salad recipes! Awesome and easy looking recipe Renee. I will be making this summer for sure. I love different types of Potato Salad. This one has few ingredients and I love that you used Red taters. Beautiful pictures too! It's really good Candice! I hope you like it and thanks for stopping by! Oh yum! I'm a sucker for both potato salad and dill, so this is right up my alley! Thanks Nora! Yup...my favs too!